It’s Cinco de Mayo, and I’m making guacamole. My guacamole isn’t original or trendy. But it’s really, really good. It tastes as fresh as can be. And really what more do you need in guacamole? It’s a dish the boys in my family enjoy making—and eating. BE CAREFUL while chopping the jalapeño. Wear gloves if you can; otherwise, just wash your hands as quickly as you can afterward, and be careful not to touch anything that could encounter any part of your body while chopping. These peppers can sting! In a 1-quart bowl, combine the scallions, garlic, pepper pieces, tomato (if desired), cilantro, and lime juice. At this point, you may leave the mixture for a few hours. About 15 minutes before you want to eat the guacamole, get out your avocados. Slice them in half lengthwise, stopping at the pits. 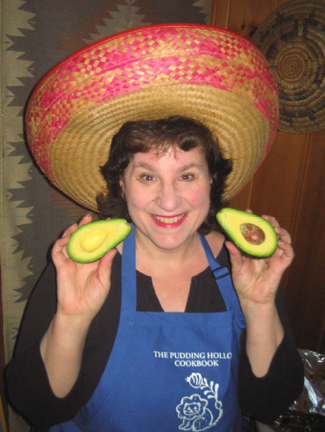 Separate the avocado halves from the pits, and use a spoon or fork to scoop out the flesh of the avocado. (If there is brown flesh, don’t use it; aim for the light green stuff.) Put the flesh in the bowl with the onions, garlic, peppers, tomatoes, cilantro, and lime juice. Mash the avocados into the mixture with a fork, adding the salt as you mash so that it is stirred in. You don’t have to mash them too much; a few chunks add to the flavor. Place the guacamole in a decorative bowl, and serve it with tortilla chips (homemade are the best, but they’re also the most fattening!). 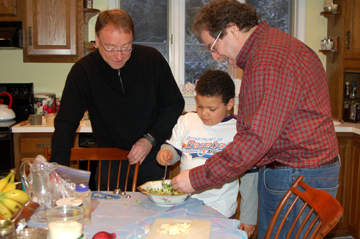 From left to right: Alan, Michael, and David mash avocados into guacamole. This entry was posted on Wednesday, May 5th, 2010 at 4:00 am	and is filed under Appetizers, Holiday Foods, Salads and Dressings. You can follow any responses to this entry through the RSS 2.0 feed. You can leave a response, or trackback from your own site. Hmm. I think I’d be inclined to reverse that and try lemon in salsa, but I’ll try anything once so I’ll definitely put lemon in my next guac. Who knew, indeed! I made your guacamole with lime juice and loved it. I’d always used lemon juice in the past. I used about half the salt and it was enough for my taste. Yummy! Thanks, Tinky. I’m afraid I’m definitely a salt girl, Sue!